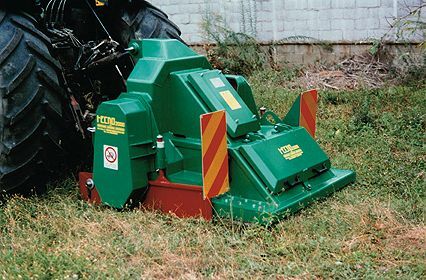 It is a combined machine that makes two operation at the same time for the maintenance and the strengthening of roads, paths, lane both for level and sloping surface. A) MIXING - The milling depth (15 cm) and the particular arrangement of the milling drills allow a mixing between the superficial and the deep coats of the road making aggregates. If we also spread binder material (concrete, lime etc...) we get an homogeneous compound for the consolidation of the road surface. 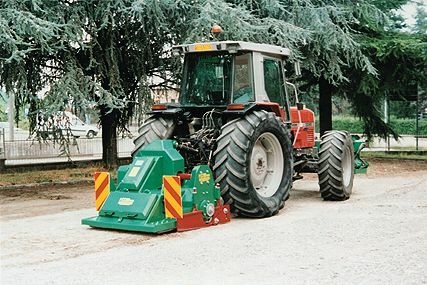 B) LEVELLING AND COMPACTNESS - The mixing obtained in this way with or without additional materials is immediatly compacted and levelled by the vibrating screen of the machine with the right lateral slopes. The reduced width (1,30 m) has been adjusted in order to work in limited space as paths and parkways.